Completed in May 1929 as the headquarters for Home National Bank and Home National Savings and Trust, the 15-story Elgin Tower has had a tumultuous history. The Crash of ’29 forced the savings institution to declare bankruptcy. From that point on, the Art Deco building housed a wide range of owners and tenants, from Walgreens to the Elgin National Watch Company. Other than a short stint of prosperity in the late 1940s, the tower never achieved its promise as the city’s landmark commercial building. Working with the current owner, Capstone Development Group, the city of Elgin in 2016 endeavored to rehabilitate the historic tower as the centerpiece of its 20-year, $50 million downtown redevelopment plan. Contractor Skender and architect Webster Design were determined to save the building, which was added to the National Register of Historic Places in 2002 but had been condemned and partially destroyed by arson. 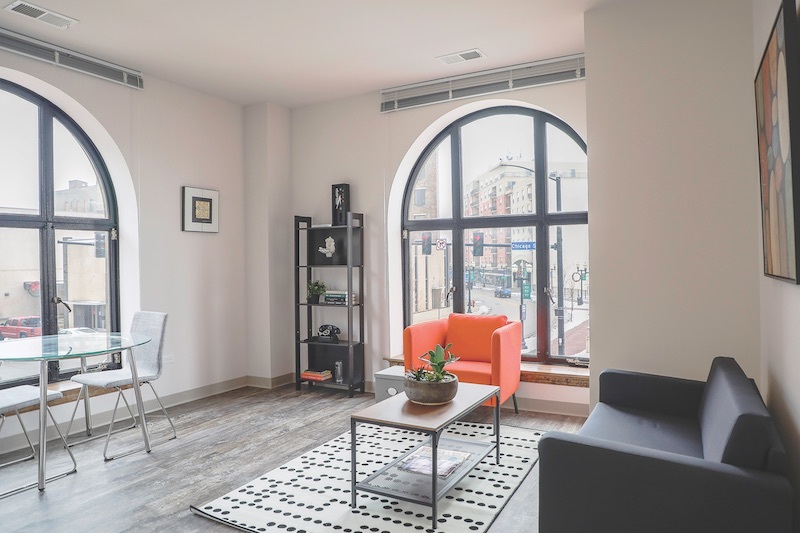 Using city/state tax increment financing and federal historic tax credits, the project team completed a 60,000-sf, $12 million gut rehabilitation that converted the office/retail building into 44 market-rate apartment units. They salvaged original terrazzo in the corridors, refinished or recreated wooden landmark unit entries (formerly storefronts), repainted and patched all the plaster, installed elevators that would operate within the existing shafts, replaced exterior windows, and conducted a host of exterior façade treatments—tuck pointing, stone replacement, and abatement. It was a logistical quagmire. With no alley, street-facing operations, or loading dock, the team had to file for multiple street closures. A hoist was only possible on the outside of the building to floor 11; there was no elevator service or hoist access on floors 11 through 15, so materials and supplies had to be carried by hand. New stairwells were cut between floors 1-3 and 11-14. Window replacement work required a 45- to 60-day approval process from both state and federal landmark commissions. All the hard work paid off. For the first time in its long history, the Elgin Tower is at near capacity (90% occupancy at press time).